Suzuki Chairman Osamu Suzuki, right, speaks during a presentation today in Tokyo alongside his son Toshihiro Suzuki. Editor's note: This report has been corrected to reflect that Toshihiro Suzuki's appointment is effective today. TOKYO -- Osamu Suzuki, the outspoken patriarch of Suzuki Motor Corp., positioned his son Toshihiro as his likely successor, appointing him president of their namesake carmaker. Osamu Suzuki, 85, one of the auto industry’s longest-serving leaders, will stay at the helm, keeping his titles as chairman and CEO, the company said today in a release. Toshihiro Suzuki, 56, is one of four executive vice presidents appointed in 2011 to run the daily operations of Japan’s fourth-largest automaker. He takes office as president and COO today. Osamu has led the company since 1978, but as years passed so did speculation about an ill-defined succession plan. Earlier this year, Suzuki conceded the need for a younger management team. His solution: Retire gray-haired board members over the following five years and bring in young blood. But Suzuki indicated he would oversee the management shuffle. Suzuki pulled out of the U.S. auto market in 2012 after nearly 30 years. At the time it announced the pullout, it had 220 U.S. dealerships. Sales topped out at 101,884 in 2007. It has continued its motorcycle and marine engine businesses in the U.S.
Suzuki’s successor will have to defend the niche carmaker’s dominant market position in India while also trying to grow sales in other emerging markets. He will also have to mop up the broken alliance with Volkswagen Group, which Suzuki is currently trying to dissolve. And the leader will also have to find ways to finance next-generation drivetrain technologies necessitated by increasingly stringent emissions standards, possibly by striking new partnerships for help. 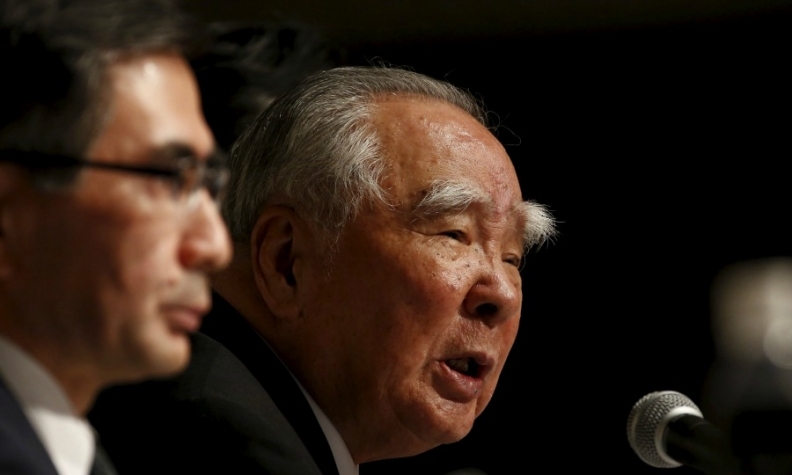 As chairman, Suzuki outlasted two company presidents who left office citing poor health. The second, Hiroshi Tsuda, resigned as president and COO in 2008 at age 63. At the time, the Suzuki temporarily took over his job titles to serve concurrently as chairman, CEO, president and COO. Hirotaka Ono, Suzuki’s son-in-law, was seen as a possible successor for Tsuda. But he died in 2007. Most observers have since eyed Osamu’s eldest son, Toshihiro, as the go-to guy. Although Suzuki Motor is traded on the Tokyo stock exchange, it has always been a family concern. As of March 2015, Osamu Suzuki held a 0.2 percent stake in the company. Born Osamu Matsuda in the central prefecture of Gifu, Osamu married into the Suzuki family. In a not-uncommon Japanese practice, after he was identified as the most qualified family member to lead the company, he was adopted by the family, taking the Suzuki name. The future CEO worked at a local bank before marrying Shoko Suzuki, one of five granddaughters of company founder Michio Suzuki, who started the company as Suzuki Loom Works in 1909. Osamu Suzuki joined the family company in 1958, which by then had changed its name to Suzuki Motor Co. The ambitious adoptee was appointed president two decades later, and Suzuki was the fourth president for 22 years, until he became chairman in 2000. Osamu Suzuki’s son Toshihiro spent two years, starting in 2001, in the U.S. at a liaison post with GM, which at the time owned 20 percent of Suzuki Motor. In Detroit, Toshihiro Suzuki helped expedite the exchange of technologies between the two companies, such as those for a fuel cell vehicle to be jointly developed by GM and Suzuki Motor. Before Detroit, Toshihiro headed the Iwata plant in Shizuoka Prefecture, west of Tokyo. Earlier, he helped manage production of mini and compact cars at Suzuki’s Kosai plant, also in Shizuoka. Two of the other three executive vice presidents, Yasuhito Harayama and Osamu Honda, have been named vice chairman and chief technology officer, Suzuki said. Suzuki hired Harayama, a former official from Japan’s powerful Ministry of Economy, Trade and Industry, to spearhead partnership negotiations with Volkswagen. That alliance broke down in late 2011, and the two companies entered arbitration to resolve Suzuki’s request that VW give up its 19.9 percent stake. Suzuki said earlier this month that the arbitration proceedings have finished and that both sides are awaiting a ruling.